Home » Travel Graphs » The World Cup of Travel: Which Country Will Come Out on Top? The World Cup of Travel: Which Country Will Come Out on Top? For the past month everyone’s eyes have been glued to the World Cup, but if you’re sick of the sight of football by now we have something that may be of more interest. Taxi2Airport have produced a World Cup of Travel which pits the 32 countries against each other based on their travel appeal. 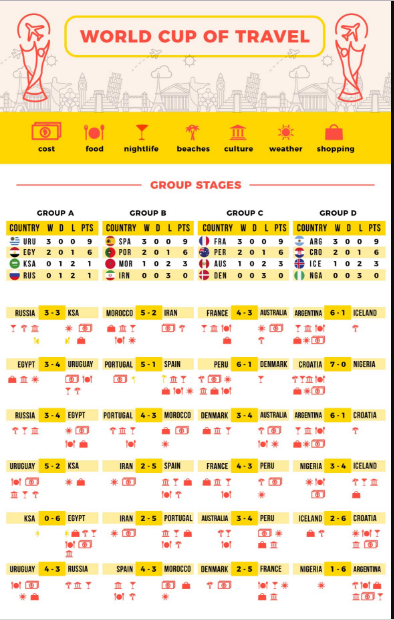 The World Cup of Travel follows the exact same format as the FIFA World cup, starting at the group's stages through to the knockouts, quarter-finals, semi-finals and final. In the end, Spain was crowned as the winners after beating Brazil in an intense final. Also making it to the semi-finals were Japan and France. The winning teams for each match were decided based on a variety of important travel factors including cost, weather, culture, nature, and nightlife. You can view the full breakdown of how the action played out in the graphic below.